The National Health Service is one of the UK’s greatest and most loved public services. It is fiercely protected, politicised, legislated around and a talking point in almost every news cycle. If you live in the UK more than likely you have used the NHS, and so too has everyone you know. To give you some perspective on the scale of the NHS, it employs more than 1.5 million people, putting it amongst the top five of the largest employee workforces in the world. It caters to a population of over 65 million people living in the UK and is free at the point of use. Its service capacity is constantly an issue, as the pressures facing the NHS seems to be increasing without any sign of slowing down. In fact, when it comes to health and awareness issues surrounding alcohol, smoking and obesity, the NHS seems to be fighting a harder battle year on year. The nature of the beast for the NHS, as a taxpayer funded organisation, has been a necessity to reduce costs and streamline services in order to provide better value - while still maintaining the quality of service the public demand. As the nation gathered last week to celebrate its 70th anniversary, we have decided to take this time, as many do during birthdays, to reflect and plan for the future. The NHS’s fight against privatisation and funding cuts sit against a backdrop of essential public health campaigns against smoking, alcohol abuse and obesity, all aimed at triggering behaviour change. That task falls to the NHS’s communications professionals that are challenged with empowering the public to take control of their health by encouraging positive lifestyle choices that reduce demand across services, and over the long-term reduce aggregated health expenditure. The digital transformation that technology and culture are driving has meant that not only are we more connected than ever before, but we are also able to engage in two-way communication via a multitude of digital channels, with organisations as well as each other. By applying a data-driven approach to communications the NHS will have the metrics to analyse campaigns, understand what works and make improvements, but more importantly do so in a cost effective way. So what are the gaps and opportunities for the NHS to adopt digital technologies and drive greater engagement, behaviour change and internal efficiencies? Earlier this year, in collaboration with comms2point0, SocialSignIn published the largest ever study into public sector adoption of social media. 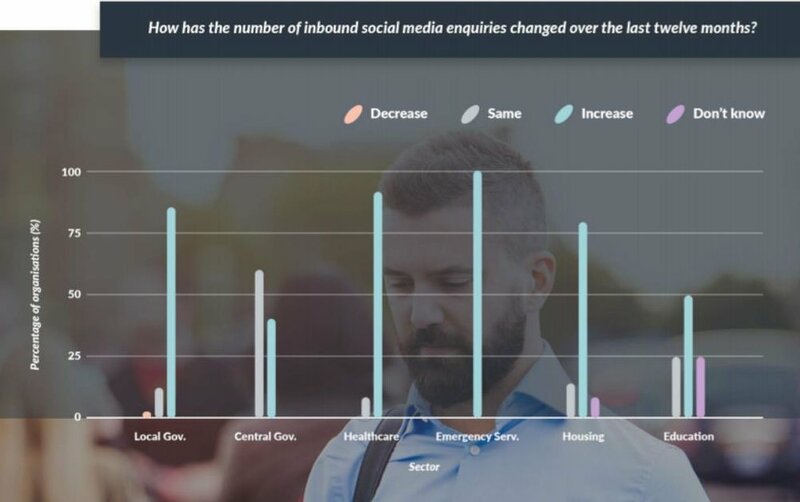 Over the last twelve month we have seen an acceleration in the growth of inbound social media messages across the public sector, particularly in Emergency Services and Healthcare. With the NHS alone seeing an increase of in 90% of the organisations surveyed. How have social media team sizes changed? 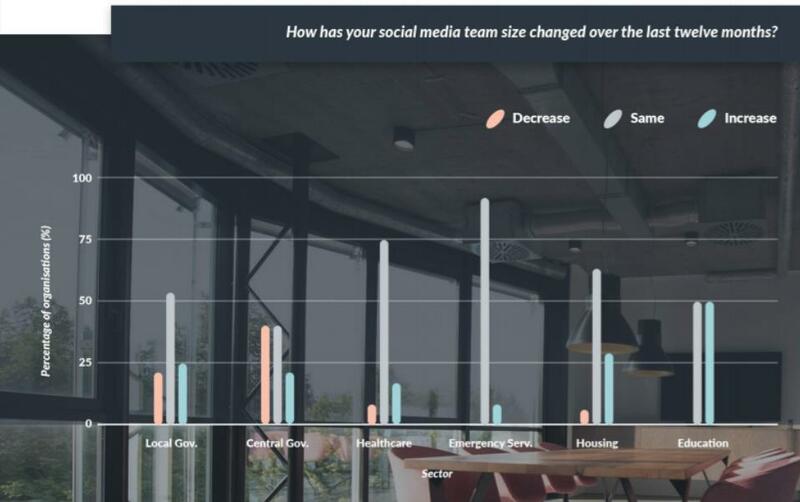 In Healthcare, 75% of organisations reported that their social media team size has remained the same, despite the growth in demand that was also highlighted. If resource is not growing in line with demand, it’s very difficult to provide a great digital experience and to inspire people to engage with our channels and content. We are all aware of the technological trends that modern society is going through, so it’s safe to assume the demand for digitally-delivered services is only going to continue. Who responds to inbound social media enquiries? The Comms team, or a combination of Comms and Customer Services, are still largely responsible for handling inbound social media enquiries in the public sector. 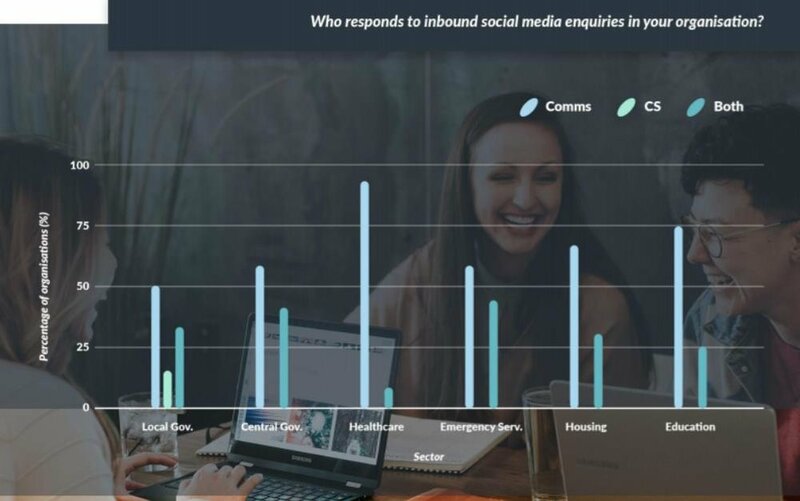 In the Healthcare sector 90% of inbound social media enquiries are handled by the Comms teams - the most across the public sector by some margin. However, do they have the resources to cope? We know that budget cuts have meant that distribution of funds leave these departments understaffed and under-resourced, at a time when investment in Comms is essential to drive real world outcomes and highlight the incredible work of front line professionals. 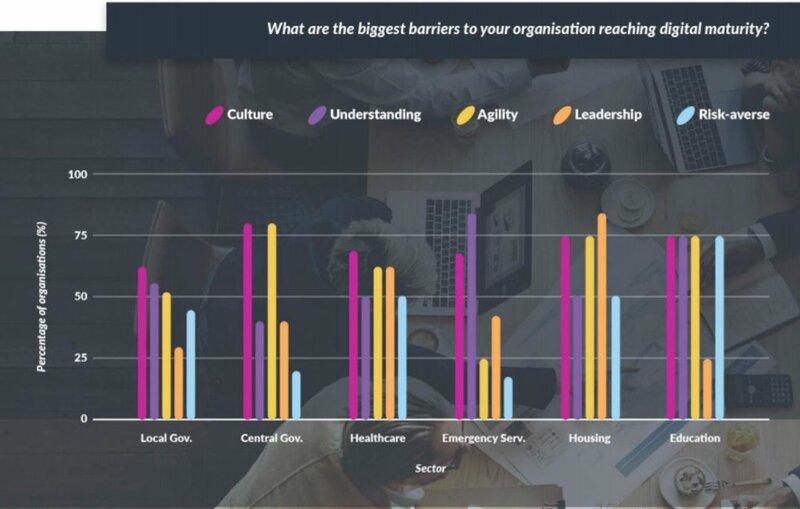 Culture was identified as a barrier to digital transformation by all public sub-sectors in 2017 and is a theme that has carried through to this year. Interestingly, although there is now a real appetite for change, “agility” and “leadership” now appear to be holding back the potential for real transformation in Healthcare. 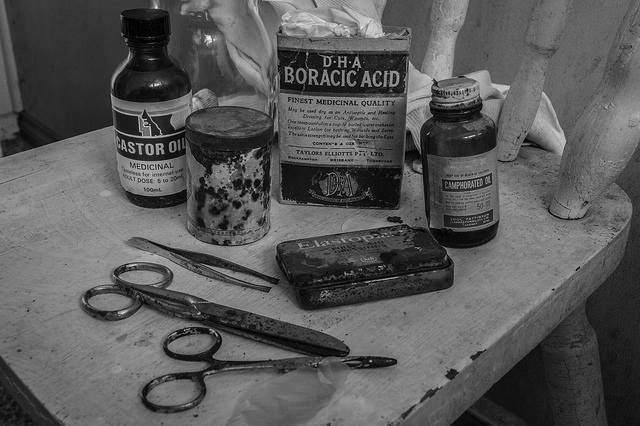 Due to the sheer scale of the NHS, making any broad changes tends to be a slow process. A perfect example being the health services transition from a paper-based system that was decentralised across the length and breadth of the country to having digitised central medical records. It was an enormous undertaking and the logistics of the transition were slowed down due in part to the fact that it required staff to adapt to new business practices further, highlighting how culture and understanding are major barriers to digital transformation in the NHS, which was borne out in our research. Can paid advertising be utilised? 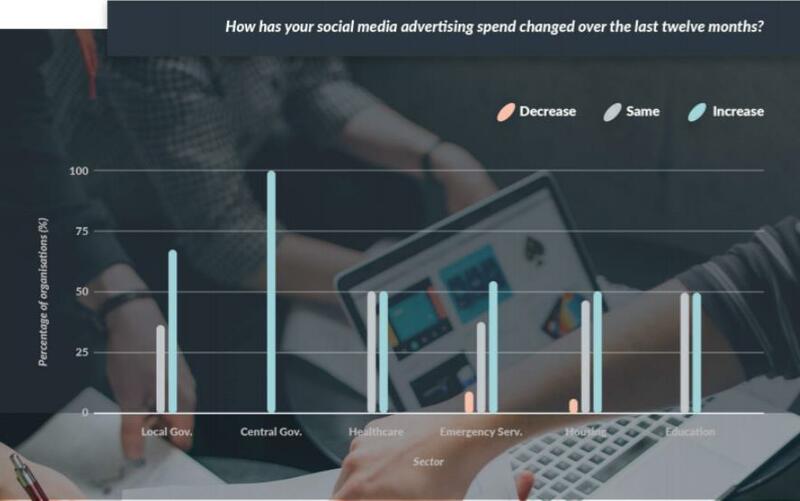 Social media advertising spend is increasing across the public sector as organisations battle against algorithm changes and fight for attention on crowded news feeds. With organic reach declining year-on-year, a paid strategy is now essential for the NHS if they want to deploy an important message to a targeted audience. It is clear that there is friction between the need for paid media and budget cuts in Healthcare, which could explain why advertising spend remained divided over the last twelve months, with some organisations spending more and some remaining the same. But nonetheless the data shows that with paid advertising increasing across the other sectors, it is a cost-effective method to deliver a targeted message. Social media and wider digital transformation across society provide us with an opportunity for the public sector and Healthcare to begin monitoring conversations, understanding trends and targeting at-risk demographics with specific content based on behaviour data. The capability is already here, and is being deployed in small pockets, to shift public perception and change lifestyles for the public good. Has it be done before? 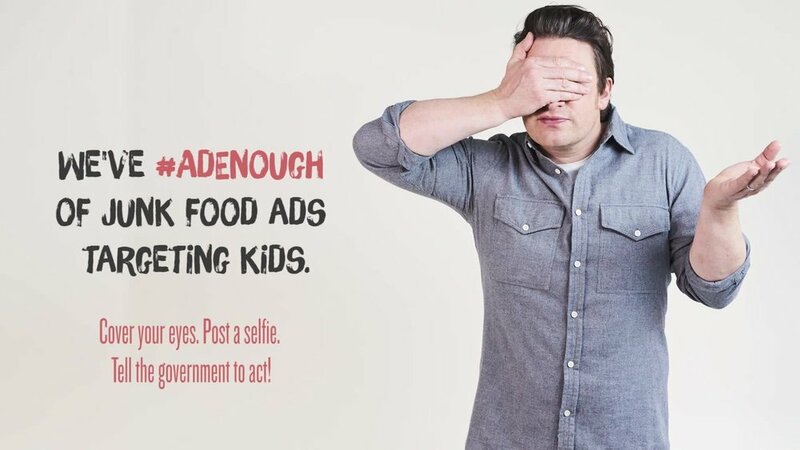 A great example of how a campaign can make a difference is the #AdEnough campaign by TV chef and celebrity, Jamie Oliver. The #AdEnough campaign was a huge online success that was spearheaded by Jamie Oliver who has long campaigned for better food standards for the nations’ youth. His previous campaign for healthier school dinners gained a reasonable amount of public attention but fell short of creating lasting change as healthier food options were an option for middle class families. His continual battle to curb childhood obesity has evolved into his latest campaign WE’VE #ADENOUGH. The premise of Jamie Oliver’s #AdEnough campaign was to ‘stop promoting junk food to our kids’ and he wanted a 9pm watershed for junk food ads on TV. A simple message with a simple hashtag #AdEnough became an online sensation. By bringing together issues around sugar consumption by the nations youth, Jamie managed to harness the power of social media to change perception. The momentum was even enough leverage for some companies to reduce the amount of added sugar in their product, notably Ribena altering the formulas of the their drink as highlighted by Jamie’s appearance in front of the parliamentary select committee. Jamie's campaign shows that the public's appetite to embrace change in the hope of improving the nation's health is there and can be achieved - with the right data, resource and campaign - hearts and minds can be won. You can download “A complete guide to public sector social media”, published by SocialSignIn and comms2point0, by clicking here.